Saint Ladislaus’ memory is still alive in the Hungarian culture: the knight king is present in our legends, he is the hero of our tales and the central figure of many pilgrimages. We invite you to visit the 44 locations in Transylvania and Hungary, to discover everything that we still cherish from the king’s cult: the built heritage, locations connected to the Saint Ladislaus legends and the beautiful natural landmarks. The project is an ongoing one: our goal is to connect the Hungarians who live in the Carpathian Basin with a cultural tour, presenting the heritage of Saint Ladislaus. Following the state-founding activity of King Saint Stephen, a significant part of Hungarian society still found it difficult to accept the Christian religion wedged into its traditional way of life and belief system, which led to a series of rebellions in the mid-11th century. This troubled period was basically ended by the reign of Saint Ladislaus, who actually managed to complete the state-founding processes begun by Saint Stephen. The activities of these two extraordinary rulers are inseparable, since what Saint Stephen started at the beginning of the 11th century, was completed by Saint Ladislaus by the end of the century. Saint Ladislaus began his reign in very difficult circumstances, which was primarily determined by his relationship with his co-regent, Solomon. Our medieval chronicles attributed such a great importance to this conflict that they presented it in more detail than the other activities of his reign. Beyond the initial difficulties, Saint Ladislaus successfully parried the repeated attacks of the Pechenegs and later of the Cumans, taking an active role in strengthening the kingdom’s eastern border. This was the cause for the ensuing confusion regarding the battle of Chiraleș, where the sources confronted Saint Ladislaus at times with the Pechenegs and other times with the Cumans. Towards the end of his reign, he was able to expand the country’s territory, as, with the death of the last Croatian king, he started incorporating Croatia into the Kingdom of Hungary. His church organising policy also proved to be significant and lasting. He reorganised the Archbishopric of Kalocsa and the Bishopric of Bihar, and in the newly acquired territory of Croatia he founded the Bishopric of Zágráb. Moving the centre of the Bihar Bishopric to Oradea (Hu: Várad), where the monarch was later buried, was especially important. He founded several monasteries, including the Benedictine abbey of Somogyvár, and in relation to this he gave an increasingly important role to the loca credibilia, strengthening the country’s manuscript culture. The 1083 canonisation of King Stephen, Prince Emeric, Bishop Gerard, and two hermits served as the basis for his church policy and dynastic objectives. During his reign, he continued to modify common law, which was recorded for posterity in the three law-codes. The wave of the first crusade hit Hungary shortly after his death. This event took place under the reign of King Coloman the Learned, however, posterity associated it with the figure of Ladislaus, who embodied chivalric ideals in a much better way, believing that the crusaders offered the campaign’s leadership to him. Although according to the historical scholarship of the 20th century he was first buried in the Benedictine abbey of Somogyvár, and only later was his body transported to the cathedral of Oradea, it is now clearly proven that Ladislaus had been buried in Oradea from the beginning. Nothing sure can be said of his cult in the period following his death. According to some historians, the gesta presenting his reign was written already in the time of King Coloman the Learned, and this text was incorporated into the subsequent chronicles. However, the fact that already shortly after his death it was said about him that “Hungary never had such a king, nor was its land so fertile after him” is quite telling. In the absence of sources, the fact that Ladislaus was canonised in 1192 might come as a surprise, as it does not have any antecedents that could be documented. The reasons leading King Béla III to canonise his predecessor that lived a century earlier are still unknown. Ladislaus’ state and church organisation policy might have played a role in this, which was increasingly appreciated by posterity, as well as the psychosis of the continually ongoing crusades, with which his figure was connected. However, it is a fact that in 1192 the Arpadian dynasty gave to Europe its third saint, and thus the triad of the Hungarian Holy Kings was established. In the period after his canonisation, his altar in the cathedral of Oradea was swiftly completed, and in the following years his legend was written. This has been preserved in several textual variants, but many other sources also show that people knew and read the legends of Saint Ladislaus, and in the 14th century these became known even beyond the country’s borders. The legend also evoked several historical facts related to the reign of Ladislaus, suggesting that the author was relying, at least partly, on historical literature. However, it also contains many topoi, such as helping the blind, deaf, mute, and lame, his fragrant body, the appearance of a star, respectively the three-year mourning. The legend also contains some more peculiar stories, such as the levitating body of the praying king, deer and cattle appearing upon his prayer in order for him to feed his army, or the story of the drinking cup set on his grave. The miracles mentioned in the legend were known in later centuries as well, however, it is surprising that it was not these that found an echo in folklore or in our later chronicles. The 13th century was undoubtedly a key period in the unfolding of the newly canonised king’s cult. Unfortunately, this is the century when we know the least about the strengthening of Saint Ladislaus’ cult. A source, unique in its own kind, the Regestrum Varadinense (1208–1235), shows that Ladislaus’ veneration has grown to be of national significance, and in the course of trials by ordeal oaths were made on his grave on several occasions (for the first time in 1216), and once on his relic. Thus, Oradea became a pilgrimage site and one of the most important centres for trials by ordeal. However, the spread of the king’s cult is best shown by the churches built in his honour throughout the entire Kingdom of Hungary, and, closely related to the former, the settlements bearing the name of Saint Ladislaus. Their dispersion does not corroborate the regional characteristics associated with his cult, which are later attested by the mural paintings depicting his legend. The iconographic type of Saint Ladislaus had crystallised in the 13th century as well: besides the insignia, the attribute that had become traditional was the battle axe, and, related to his attire, his armour became more significant, alluding to his knightly virtues. He appears as such in his first pictorial representation on the 1291 grand seal of the Chapter of Oradea. The spectacular spread of Saint Ladislaus’ cult during the 13th century created a solid basis for the maximisation of this cult in the next century. The Hungarian Anjou kings, in their endeavour to achieve the unhindered dynastic transfer of royal power, played a leading role in this process. One of the pillars of the Angevine dynasty’s claim for legitimacy was the particular reverence shown towards the cult of Saint Ladislaus, which proved to be very varied even when taking into consideration the high scarcity of vestiges. First of all, the royal patronage of the cathedral of Oradea deserves special attention: with royal support, the cathedral was completely rebuilt, furthermore, some members of the dynasty were buried there (Queen Beatrice of Luxembourg and Queen Mary of Hungary). Saint Ladislaus’ cult gained national significance also due to the fact that on the reverse of the third gold Florin of King Louis the Great, it was the figure of Saint Ladislaus that appeared instead of the earlier representation of Saint John the Baptist. By this, the king created a tradition that defined the iconography of Hungarian coinage until the 16th century. The spectacular strengthening and transformation of Saint Ladislaus’ cult is best illustrated by our Angevine chronicles. The Chronicon Pictum, the Chronicle of Pozsony, and the Chronicle of Munich detail the reign of Saint Ladislaus, as well as the victorious battles against the Pechenegs and Cumans. The story of the rescue of the girl that was abducted by the Cuman soldier during the battle of Chiraleș in 1068 appears for the first time in these texts. The abduction of the girl is related similarly, with minimal deviations. The Chronicle of Pozsony gives perhaps the most fleshed out reason for the pursuit, but in other respects the Chronicon Pictum is the most detailed: at first, Saint Ladislaus believed that the girl abducted during the battle was the daughter of the bishop of Oradea, that is of his younger brother, Coloman. An important element of the chronicle’s narrative is that the girl actually let herself be “abducted” because she wanted to bed the Cuman, she even asked Ladislaus to spare the life of the soldier. Saint Ladislaus essentially prevented the culmination of this idyll, which was deemed to be immoral. The version according to which the girl was really the Cuman’s victim and she took part in killing him appears in the chronicle of Heinrich von Mügeln and in the Russian Annals. Saint Ladislaus became thus the hero of victorious battles. The fact that in the first half of the 14th century the Tatar threat was still strong at the country’s eastern border conveyed political timeliness for his battles with the pagan Pechenegs and Cumans. The cult of the Holy King, increasingly endowed with knightly virtues, intensified in this context, reaching spectacular proportions in certain regions. Saint Ladislaus became a typical knight saint, similar to the French King Saint Louis, whose Hungarian cult was also established by the Angevine dynasty. The pictorial representation of Saint Ladislaus’ legend was curiously not built on the traditional narrative of our chronicles, but on the version contained in the chronicle of Heinrich von Mügeln. This is valid not only for the wall paintings, but also for the pictorial narrative of the Hungarian Anjou Legendarium. The latter relied on both the historical and the hagiographical tradition and contains the fullest pictorial cycle of the legend of Saint Ladislaus. As for the legend of the battle with the Cuman, it was composed of six scenes: 1. Oradea Castle. The bishop’s blessing; 2. The march of the Hungarian army (or both armies); 3. The chase; 4. The fight; 5. The decapitation; 6. The rest. The legend found a surprisingly good reception all throughout the Hungarian Kingdom. At the moment, we know of more than sixty churches where the painting cycle depicting the fight with the Cuman was illustrated, but their true number could be much greater. Most of these are found in today’s Romania and Slovakia, and to a lesser extent in Hungary, Austria, and Slovenia. 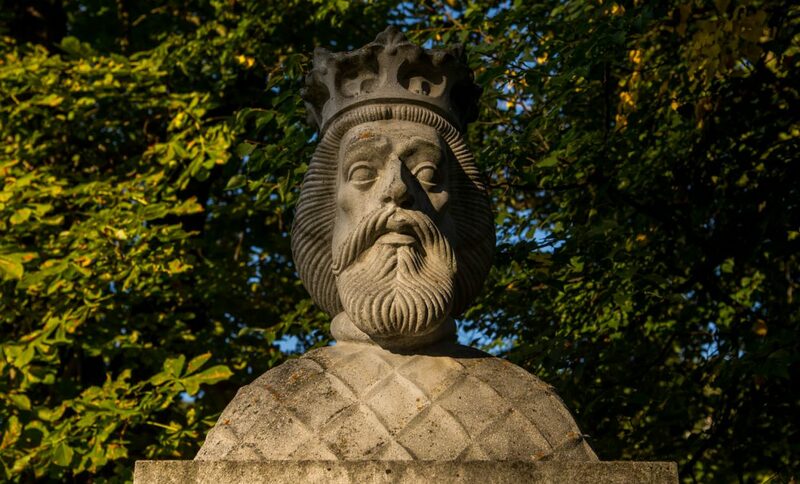 According to the scholarship’s current standing, the representations of Saint Ladislaus are especially frequent in two historical regions: in the Szepesség (Spiš) Region and its neighbouring areas, and in Szeklerland. This gave basis to the earlier historical and art historical research’s conclusion that the cult of the king was spread first and foremost among the privileged Saxon and Szekler communities that were charged with guarding the borders. However, the repeated discovery of new painting cycles related to Saint Ladislaus have modified this idea and clearly point to the fact that the wall paintings were spread all over the Hungarian Kingdom. Nevertheless, the density of the wall paintings in these two areas is considered a fact in the field of the topography of art, and this phenomenon cannot be completely ignored. This is enriched by such further representations found near the border, as Gutor and Szentmihályfalva in the Csallóköz Region, respectively Felsőlövő and Bántornya in the Őrség. The connection of the cult of Saint Ladislaus, who in the 14th century was without a doubt venerated as a knight saint, with the border regions became a self-evident phenomenon, and its role in the battles with the Tatars is clearly revealed by the chronicle of the Anonymous Minorite. According to this, the Szeklers were led to victory by Saint Ladislaus himself during their 1345 campaign against the Tatars. The legend was depicted in churches and monasteries under noble patronage, as well as in towns. The cycle has many regional features: the sequences are usually incomplete, and in some cases new characters appear that are hard to identify. There is no doubt that in such cases local traditions have to be considered as well. For example, in Mugeni (Hu:Bögöz), which appears to be the earliest depiction of the legend in the Szeklerland, there are two girls taken captive during the battle. The most atypical sequence can be seen in Bántornya, in the region of Őrség, where other scenes of the legend of Saint Ladislaus were also presented. The quality of the representations varies considerably. There is no doubt that with regard to the need for detailed representation, the painting in Dârjiu (Hu: Székelyderzs) is far superior to all the others. The scenes offer an insight into the period’s clothing, armaments, building types, and details regarding warfare can also be observed on them. This profane story, presented in some cases in rich details, is a unique visual source of the 14th century. Regarding the 15th century, the series of monuments referring to the medieval cult of Saint Ladislaus are supplemented with fewer pictorial representations, but some of these are very important works of art. The monumental equestrian statue of the king, cast and erected in Oradea in 1380, was undoubtedly a masterpiece of European art. Unfortunately, this most important piece of the oeuvre of sculptors Márton and György of Kolozsvár was destroyed by the Turks after occupying Oradea in 1660. Another masterpiece of our mediaeval art, perhaps the most important relic following the Holy Right Hand of King Saint Stephen, is also connected to the name of Saint Ladislaus. The Herma of Saint Ladislaus was created at the beginning of the 15th century, after the former one was damaged during a fire in the cathedral’s sacristy. The head reliquary, which was undoubtedly the most important relic related to the cult of Saint Ladislaus, was kept in the cathedral of Oradea until 1600. Currently it is found in the cathedral of Győr. The full-page illumination in the Augsburg edition of Johannes de Thurócz’s chronicle is also worth mentioning from the 15th century. Surely it is no coincidence that it was Saint Ladislaus’ fight with the Cuman that was emphasised in the chronicle, as in the political context of the period of King Matthias, it was an explicit reference to the conflict with the pagan Turks. Clearly, by the 15th century Saint Ladislaus had already departed from the line of dynastic saints, where he was still found during the Anjou kings, and became a “national” knight saint. He appears as such in the register of the Viennese students belonging to the Hungarian nation, as the illumination of the initial A. Naturally, the cult of Saint Ladislaus did not disappear with the Middle Ages. During the 16th and 17th centuries, the constant battles with the Turks kept alive the cult of the warrior saint among the country’s Catholic population. In the 19th century, he became the historic hero of the historicist movement, which aimed at strengthening national ideology, as well as the Christian king invested with knightly virtues, defending his country. This is how he appears on historicist paintings, various illustrations, epic poems, and other literary texts, whether poetry or prose. In addition, there was another Saint Ladislaus living in oral tradition, who was invested with countless legends by local traditions. Some of these were recorded in the 15th century by Pelbartus of Temesvár, and can still be detected in some regions: creating springs (Nyitra, Debrőd, Torda, etc. ), the Cuman gold or the coins of Saint Ladislaus (western Transylvania, Transdanubia), the imprint of Saint Ladislaus’ horseshoe in a rock (Püspökfürdő, Jászó, Vácszentlászló, Torda). It can be seen, therefore, that the reverence of Saint Ladislaus that started to evolve in the 12th century grew into a very varied cult, spreading all over the Carpathian Basin, and permeated the religious beliefs of every social stratum from ruler to peasant. Saint Ladislaus became the most popular figure of the Hungarian saints, whose cult and heritage has not faded over time, but is still alive. Partner: Szerencsejáték Service Nonprofit KFT.